Nothing makes us happier than a big bowl of green, fresh, & delicious goodness. We'd take it for breakfast, lunch or dinner! As a team that spends a lot of time writing about food, we love when recipes are as delicious as they are beautiful, and this recipe does not disappoint. 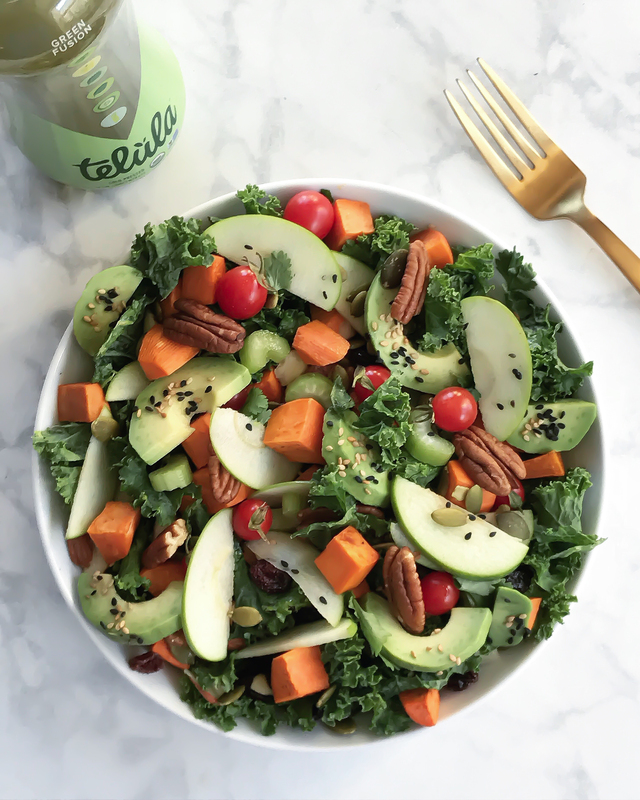 Packed with fresh massaged kale and roasted vegetables, and drizzled with a simple vinaigrette, it is the perfect fall lunch to have packed to go & it pairs perfectly with Telula Cold-Pressed Juice (Green Fusion). Free from preservatives and packed with nutrients, Telula Cold-Pressed Juice is the perfect healthy lunch complement! Be sure to check out your local Whole Foods where Telula Cold-Pressed juice is on sale! Also, check your local grocery stores juice aisle or find it near you here! 1. In a bowl, coat the sweet potatoes with the avocado oil. Season with sea salt and black pepper and toss. Lay out the sweet potatoes on a baking sheet. Bake in the oven for about 45 minutes at 400F, flipping halfway through. When ready, remove from the oven and set aside to cool. 2. Use the bowl to massage the kale and the extra-virgin olive oil with your hands for a few minutes. Divide the kale between the two serving bowls. 3. Divide the roasted sweet potatoes, green apple slices, cherry tomatoes, celery, avocado, dried cranberries, pecans, pepitas, and sesame seeds between both bowls. 4. Combine the ingredients for the dressing in a small bowl and stir. Drizzle the desired amount of dressing over both bowls.